'Comparing a men-only pilgrimage with past blots like sati or untouchability is propelled by politics, mischief and malevolence,' argues Sudhir Bisht. I have been thinking of writing on the Sabrimala temple issue for quite some time, but I thought that I should allow the intellectuals and leaders to make their points of view before I present my own point of view. Let me begin by saying that I am a Hindu who believes in the trinity of Brahma, Vishnu and Mahesh, the creator, the preserver and the creative-destroyer. I may not believe in all the multitudes of incarnations of the Trinity of Gods but I always bow my head whenever I pass by a temple dedicated to hundreds our Gods, and their various avatars (manifestations). I may have a lack of interest in the lengthy rituals during birth, wedding, anniversaries and death but I have no problems if other members of my family and my extended family follow all the rituals 'to a T'. As long as I am not forced to partake in the rituals, and the rituals don't agonise anyone in general. At the same time I believe that it is the sole right of the organisers to decide whom to call for a ritual or whom not to call for participating in a ritual. I represent a common man who is a born Hindu but does not conform to any specific ritual of prayer or havan or puja. I pray every day but in my own home as the temple crowd terrifies me. I have been to the revered Mata Vaishno Devi shrine 10 times, sometimes propelled by my own bhakti-bhaav (devotional motivation), and at other times due to the fact that as a field manager of an oil marketing company, I was often forced to accompany all the visiting company officials from Delhi and Mumbai. If left to me, I would never have accompanied all those visitors who travelled from various parts of the country to our office in Jammu, ostensibly for official reasons but who actually 'managed' to get their tour approved for having a darshan of Maa Vaishno Devi. I am deliberately taking my time to explain what kind of a Hindu I am, because it is important to know what my motivation is, in writing this piece. I have a very simple stand on the matter of Sabarimala and Lord Ayyappa. The non-inclusion of women of a certain age group in the pilgrimage is a tradition that doesn't inflict any harm upon anyone. It appears to stand on a firm religious motive and I see no reason for any court in India to change this tradition. The courts in India have lawyers swarming the court rooms in their heat-absorbing black trousers and black jackets in the sweltering heat of India that prevails for over two-thirds of the year. The tradition of wearing black trousers and black jacket is something that is agonising, and if this tradition is persevered with then there is no need for changing the men-only tradition of Sabarimala yatra. I pray every day in my home, not at the small puja space that my wife has set up with the deity facing a particular direction, but in my drawing room, sitting comfortably on the sofa and saying my prayers in peace, all by myself. But I have no problems with the temples that are flocked to by devotees every day. There is a Shani temple near my house where people offer mustard oil on Saturdays. On Tuesdays there are hundreds of devotees who line up to have a darshan of Hanumanji. They offer boondi and ladoos to the presiding deity and distribute the prasadam to everyone who comes in contact with them. There is even a temple devoted to Bhairo Baba near the exhibition ground at Pragati Maidan in my beautiful but polluted city of Delhi. The temple is situated not very far from the Supreme Court building, and here the bhakts offer alcohol to the deity. Yes alcohol in all its configurations -- whisky, vodka, rum, gin -- everything except beer! Just as there are different temples with distinctive set of offerings, varied forms of prayers and uniquely auspicious days of prayers, there are temples that follow gender-based entry norms. There are temples that permit only women into the sanctum sanctorum and there are temples that don't allow menstruating women to enter. And I have no objections to that since the temple managements have framed certain rules that are needed to govern the temple. The temple rules of pilgrimage are built upon convention and religious beliefs. As long as these religious beliefs don't hurt anyone physically or inflict any mental torture on anyone, the beliefs have a right to be practised unhindered. Just as the Constitution of India grants the right to equality to all men and women, it also gives the right to freedom and the right to freedom of religion. The recent Supreme Court judgment that takes away the right of Lord Ayyappa's temple management in regulating devotees is a violation of the right to freedom and the right to freedom of religion. The Ayyappa temple doesn't allow women of menstruating age groups to take part in the pilgrimage. This ritual has existed for centuries and the ritual doesn't injure anyone, nor does it persecute any section of the society. 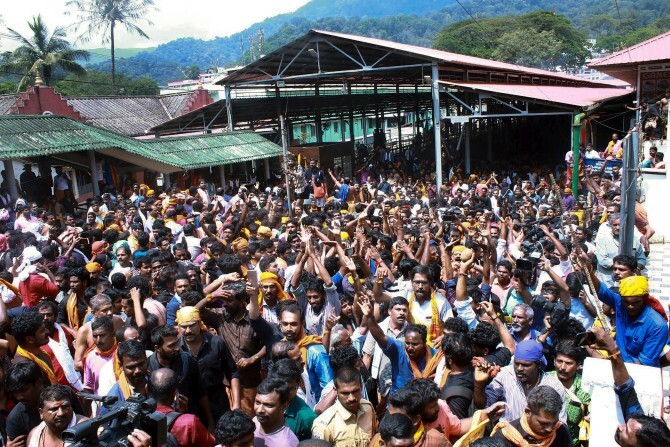 The practice of not including women in the Sabarimala pilgrimage is based upon the belief of Lord Ayyappa, the son of Shiva, being an eternal celibate. Some believe that Ayyappa being a brahmachari (bachelor) had the highest respect for women and didn't want them to prostrate before him. It is also believed that being of shy nature in front of women, Lord Ayyappa feels uneasy when gazed at by women. And Lord Ayyappa's right to his privacy and exclusivity must be respected by one and all. Some liberals have taken it upon themselves to change the basic nature of the temple and the rituals and customs associated with it in the name of right to equality for women. I was surprised to read an article from S A Aiyar, wherein the brother of Mani Shankar Aiyar says that preventing women from offering prayers at Sabarimala is similar to committing atrocities on Muslim women by triple talaq! Nothing can be more ridiculous that this analogy. Triple talaq is an iniquitous and wicked practice that treats women as doormats. On the other hand, the ritual of excluding women from the Sabarimala temple is not a process of inflicting any material or moral wounds on womanhood. It is just a tradition to fulfill the wishes of those who built the temple. It is not about debarring women from contesting an election. It is not about stopping a woman from claiming any benefit under any government scheme. Come of think of it, tomorrow can men go to the Supreme Court and demand the abolition of reservation of seats for women in panchayat or municipal elections? Not allowing women to participate in the Sabarimala pilgrimage is like not allowing Rafael Nadal to compete in the WTA finals. Restricting women of a certain age is like restricting Serena Williams from competing in the ATP season ending finals. Just as the WTA finals is a women-only event, the ATP finals is a men-only event. Nobody raises any stink about not allowing Virat Kohli in the cricket team that is lead by Mithali Raj, captain of the Indian cricket team for women. Just as there are temples where men are not allowed, there are a handful of temples where women are not allowed. Lord Ayyappa too has his right to grant visitation rights based upon his sense of comfort and that can only be interpreted by the owner-administration of the temple. Just as there is the Indian Press Women's Corps with its building at 5, Windsor Place in the heart of Delhi, there is an abode of Lord Ayyappa at the hilltop in Kerala. At the IPWC, the menfolk are not allowed to enter unless they are guests of one of the women members and similarly at Sabarimala, women of certain age group are not allowed to enter. I agree with the noted editor-writer Shekhar Gupta when he says, 'Supreme Court cannot become the priest between Indians and their Gods'. The seat of Lord Ayyappa is a lot higher than the seat of any judge in India. As long as the social or religious practices don't cause any material harm and don't lead to any mental torture, it shouldn't become the object of arbitration by any arm of justice. Comparing a men-only pilgrimage with past blots like sati or untouchability is propelled by politics, mischief and malevolence. I am glad that the order passed by the Supreme Court on Sabarimala will be reviewed soon -- and I hope that the old order will be restored.